Monday night concluded my Digital Photography 101 class at the Littleton Studio School. I had taught a one hour floral photography workshop at last year's Lupine Celebration, but this was my first real experience being a teacher. My friend, Nicole of Coley's Creations is often teaching kids' classes at LSS, so I asked if they would be interested in offering photography. They had never offered photography before, and were willing to give it a try. We met Mondays at the LSS where we would work on editing in Lightroom and review the Powerpoint for that week's lesson. On Wednesdays we went on location to practice our skills, and it was so satisfying to watch the connections and ah ha moments unfold. We learned composition the first week and shot at Remich Park and The Dells in Littleton. I snapped a few photos of my own, and really appreciated the "just go shoot" mentality. There was no shot list, no editing deadline, just the woods, my camera, me, and my students. I decided to walk the walk and work on my focusing, and played around with the Rule of Thirds. After the class had snapped their assignments, we took focusing to the next level with macro photography. Unfortunately I don't have a macro lens, but the class took some great shots. The second week we worked on white balance and ISO on Main Street, Littleton. The third week we trekked to The Basin and played with shutter speed, learning how to capture motion. They loved the flowing water look that long exposures allow. The following weeks we covered aperture and depth of field in the lupine fields of Sugar Hill, and learned portrait photography at The Rocks Estate. I wasn't able to take photos those weeks, but I'm very impressed by the many gorgeous shots my students were able to capture. Teaching is something I'm not used to. There were challenges and Powerpoints to put together, but at least I didn't have grading. The best and most rewarding part is always growth. Watching students progress from having no idea what the exposure triangle is, to capturing beautiful photos that are gallery worthy. I can't wait to teach again! Shelby took me out to dinner in Lincoln this week and suggested that I bring my camera. 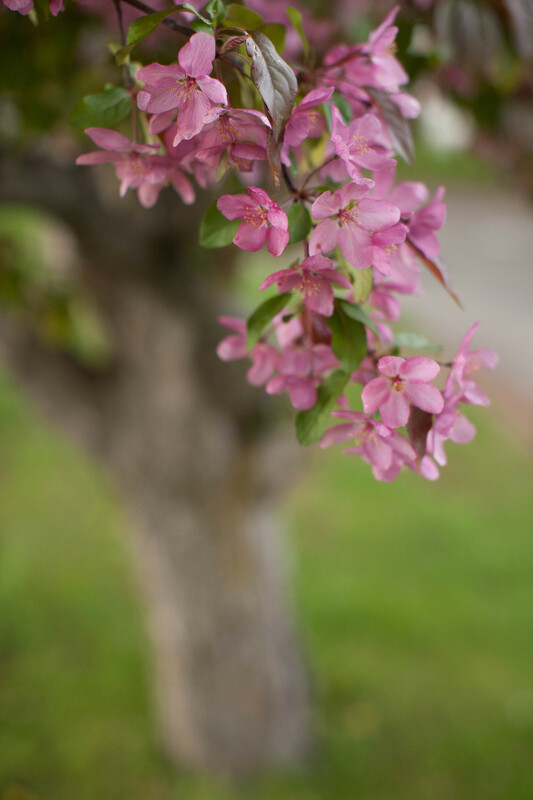 It was a blue, rainy day and I admired how the overcast sky was making the pink apple blossoms pop. We stopped at Price Chopper, where there was a beautiful row of apple trees in the parking lot. It's incredible how beauty can be found in the unlikeliest of places. Not only that, towards the end of the parking lot shoot, the sun came out.